ASUS Republic of Gamers (ROG), the world’s undisputed no.1 gaming brand opens ROG Master 2016 Philippine qualifiers to professional gamers and enthusiasts. ROG Masters strives to uncover rising talent in the Asian DOTA 2 and CS:GO scenes and bring it into the international spotlight. Throughout the regional qualifiers the stars of tomorrow are given their chance to shine. The most substantial matches will be broadcasted live and provide the newcomers with a chance to demonstrate their skills to their fans and followers. ROG Masters 2016 Philippine qualifiers is now open for registrations for both DOTA 2 and Counter-Strike: Global Offensive (CS:GO). The ROG Masters is an action-packed and exciting gaming event that challenges both professional gamers and enthusiasts to show what they got in terms of strategy and tactics in games like DOTA 2 and CS:GO. The ROG Masters is considered as one of Asia’s largest eSports tournament with a grand prize amounting to $200,000 for the world championship and PHP 115,000 for local qualifiers. From August 30 til September 9, gamers and interested participants all over the Philippines can register their teams through the official ROG Masters Philippine qualifiers microsite http://rog-masters.ph/. From September to October 2016, DOTA 2 and CS:GO Philippine teams will battle it out in a series of local qualifiers for a spot in the ROG Masters grand finals which will be held in Kuala Lumpur, Malaysia from 12th to 13th November, 2016. ROG Masters comes to the Philippines with the local qualifiers happening for DOTA2 and CS: GO teams. Online and on-ground qualifiers will take place for each game. From every qualifier top teams will advance to local LAN finals which will happen in a premier gaming hub around Metro Manila on either September 17 or September 18, 2016. The top 2 teams of Philippine qualifiers for both DOTA 2 and CS:GO will get a slot in quarter finals alongside with other Asia qualifiers. 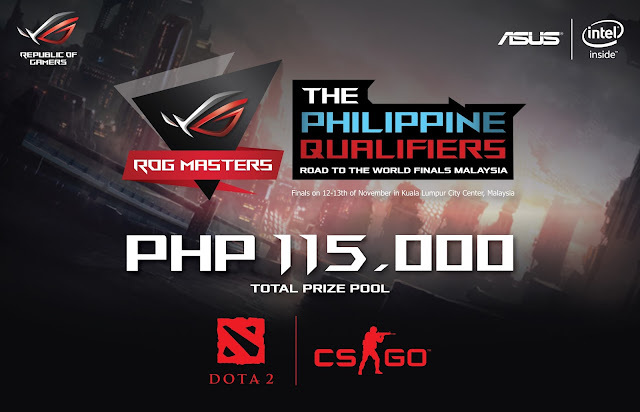 Moreover, the other teams who will not qualify from Philippine qualifiers, can still participate in Southeast Asia (SEA) qualifiers by completing the team registration on the ROG Masters official site which can be accessed here. Asia has dreamt. Asia has anticipated and practiced. Now, Asia is rising. “The Philippine eSports scene is starting to get really exciting day-by-day. Few months ago, we partnered with the Professional Gamers' League (PGL) in mounting the world’s biggest DOTA 2 tournament series in country which is the Manila Major. And look, here we are now creating our own incredible gaming tournaments that aims to empower rising talents and future eSports local superstars as early as today,” shares George Su, Country Manager of ASUS Philippines System Business Group. 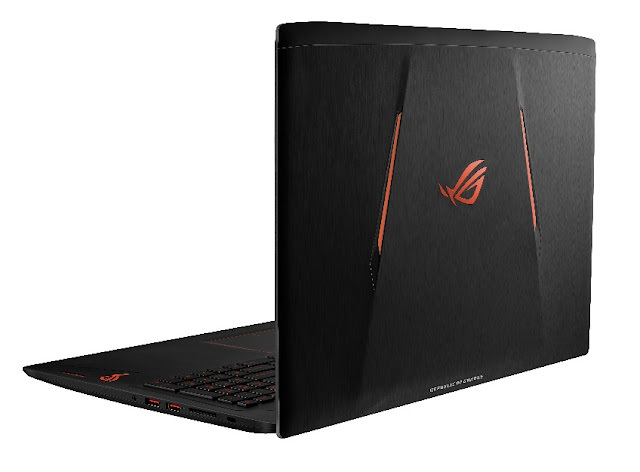 The ROG Masters Philippine qualifiers’ full gaming mechanics can be reviewed through this link. Attached and below is the official ROG Masters 2016 official announcement PR that we hope you can share to your respective websites and social media channels. The new generation of workforce, the Millenials, wants to grow with a company that respects their individuality while being part of a noble cause. Such opportunity is possible when one becomes a Financial Advisor. 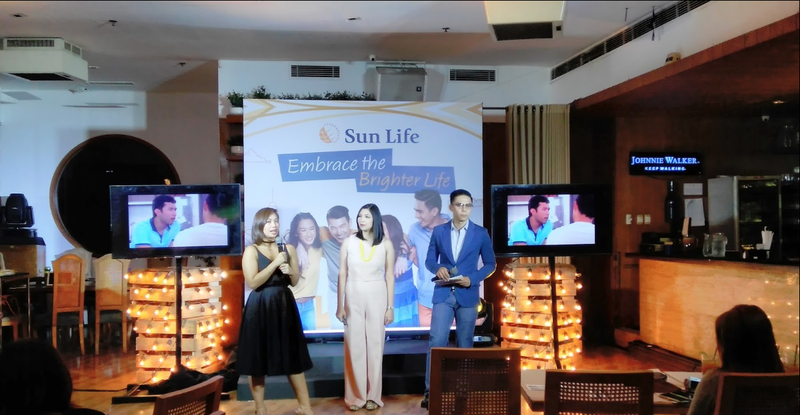 This is a door that Sun Life (of Canada) Philippines, Inc. opens wider with a recruitment drive called #LiveBrighter. It aims to present the profession as a career choice for Millennials who wish to have the time and resources to pursue their passions as they advocate financial foresight and planning. “Millennials are known to be slashers as they juggle a lot of things live travelling, blogging, and other passion projects on top of their regular 8-5 jobs. It sounds very aspirational but how can they sustain this in terms of time and resources?” said Sun life Recruitment Manager Fin Bernardo. “With that in mind, we see that the profession of a Financial Advisor is a perfect fit for their lifestyle,” added Bernardo. After introducing the Financial Advisor in popular culture thru its engagement with Cinema One’s Single/Single, Sun Life dishes out the #LiveBrighter Sessions. This is a series of meet-ups to show how a Financial Advisor lives up to the demands and rewards of the profession. It aims to reach more Millennials and send them the message that their dream job is just here all along. Guided by the core values of a Sun Life Financial Advisor- caring, professional, inspiring, and winning - #LiveBrighter Sessions will give a taste of the benefits one can enjoy in choosing this particular career path. More than the chance to earn unlimited income, it also provides perks such as all-expense travel and the freedom to work with an unbridled schedule. With more Filipinos keen on getting insurance and investment products, the possibilities for new Advisors are endless. “We need more Financial Advisors to educate Filipinos on the importance of preparing for unexpected life’s events and offer them solutions that let them have Money For Life,” explained Bernardo. Choose to #LiveBrighter now. Register to the next #LiveBrighter Forum by visiting bit.ly/LiveBrighter. Sun Life of Canada (Philippines), Inc. is a member of the Sun Life Financial group of companies, a leading international financial services organization providing a diverse range of protection and wealth products and services to individuals and corporate customers. Sun Life Financial and its partners have operations in key markets worldwide, including Canada, the United States, the United Kingdom, Ireland, Hong Kong, the Philippines, Japan, Indonesia, India, China, Australia, Singapore, Vietnam, Malaysia and Bermuda. As of March 31, 2016, the Sun Life Financial group of companies had total assets under management of $861 billion. Sun Life Financial Inc. trades on the Toronto (TSX), New York (NYSE) and Philippines (PSE) stock exchanges under the ticker symbol SLF. Labels: #LiveBrighter, Financial Management, Insurance, investments, Investments in the Philippines, Managing Finances, Millenials, Sun Life Financial, Sun Life Financial Inc. The National Accreditation Board for Hospital International (NABH International) continues to support the Philippines in gaining international accreditation in the field of healthcare. The latest accreditation was awarded to St. Frances Cabrini Medical Center. A non-profit organization, NABH International is recognized by International Society for Quality in Health Care (ISQua). One of the organization’s main objective is to redefine healthcare quality in the developing worlds but at the same time, providing accreditation with an affordable cost. The organization has seen their main objective being imbibed by this world-class provincial medical center. St. Frances Cabrini Medical Center, located in Sto. Tomas, Batangas, has always held on to their mission statement which is to passionately strive in providing healthcare needs and deliver high quality healthcare service to improve lives. The hospital has aimed to provide excellent service to the entire Calabarzon (Cavite, Laguna, Batangas, Rizal and Quezon) region. 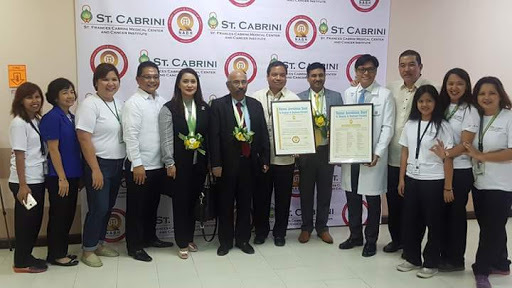 They have achieved various milestones one of which is to be one of the only four hospitals in Southern Tagalog accredited as a Center of Excellence by the Philippine Health Insurance Corporation (PhilHealth). It has also been the chosen venue for international medical missions targeting indigent people of Region IV and V that do not have access to proper medical care. These missions support the hospital’s advocacy and that is to ensure that they extend the same quality of service to everyone who goes inside their hospital doors who is in need of medical care. “St. Frances Cabrini has complied with all the standards of NABH International. This ranks them at par with the best hospitals in the world in terms of patient care and patient safety.” NABH Director Dr. BK Rana stated who was also one of the assessors. St. Frances Cabrini is the only hospital who is a participant in the United Nations Global Compact Initiative. An organization that is anchored in the practice of human rights, fair labor practice, and protection against corrupt practices. "Although our hospital had all the universal equipment and qualified specialists all these years, the hospital achieved NABH accreditation only when it thoroughly started following all the NABH norms of documentation, patient safety and patient education. The NABH accreditation is actually more for the interest of the patients’ care and safety as it ensures best treatment for patient," said Dr. John Cresencio F. Alonzo, SFCMC President/COO. Having an international accreditation also gives the Philippines the opportunity to explore the medical tourism industry that is currently on an uptrend. St. Frances Cabrini is the first to be proclaimed as a Medical Tourism Special Economic Zone. Another achievement under the hospital’s long list of distinctions. The NABH International plans to continue extending their international accreditation to the Middle East and South Asian Association for Regional Cooperation (SAARC) countries. The process may be tedious but once the organization completed and passed the assessments, they will be accredited for three years. “This accreditation does not only target city hospitals. NABH International also provides accreditation to small health care organizations, wellness centers and blood banks to name a few. Each category has a set of standards that they need to comply with. These organizations may apply under the relevant accreditation program that depends on the services that they offer. Hopefully, more hospitals and wellness centers in the Philippines will achieve international accreditation in order for the Philippines to gain global acceptance in the field of healthcare,” Alumno added. The Filipino Portrait Artists’ Guild, Inc. (FPAGI), a group of portrait artists based in Manila, will be opening their first group show on August 25, Thursday, 5 pm at Gateway Gallery. 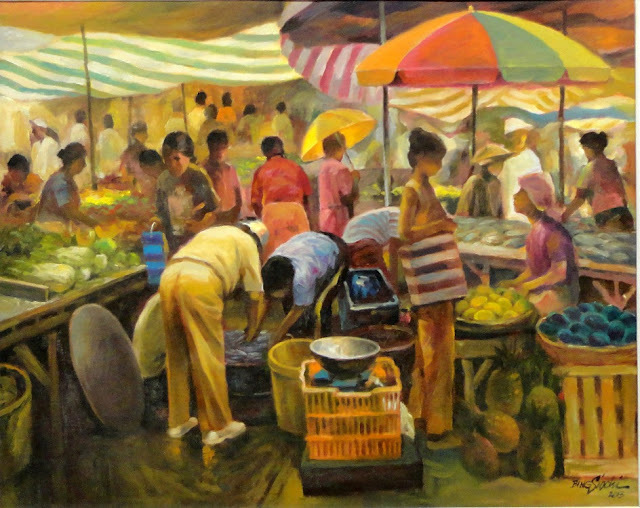 The 21 artist-members have lined up various figurative paintings that depict the Filipino at work, during leisure, in motion and at rest. The works are indicative of the artists’ level of understanding of the human figure in relation to his or her environment, showing variety of styles, composition and influence. The artists participating in the exhibit include Donat Alvarez, Mardy Aguilar, Adi Baen, Grandier Bella, Cee Cadid, Carlos Castro, Romy Carlos, Rick De Villa, Norman Dreo, Tess Duldulao, Esther Garcia, Horacio Gillego, Sen Lacson, Lea Lim, Nemi Miranda, Lupicinio Ng, Alvin Montano, Noel Pocot, Menchu Sarmiento, Bing Siochi and Myke Velasco. Everyone is invited to grace the opening on August 25 which will have Dr. Raul Sunico as the guest of honor. Dr. Sunico is the President of the Cultural Center of the Philippines and the Dean of the UST Conservatory of Music. The exhibit will run until September 8, 2016. Gateway Gallery is located at the 5F, Gateway Tower, Araneta Center, Quezon City. 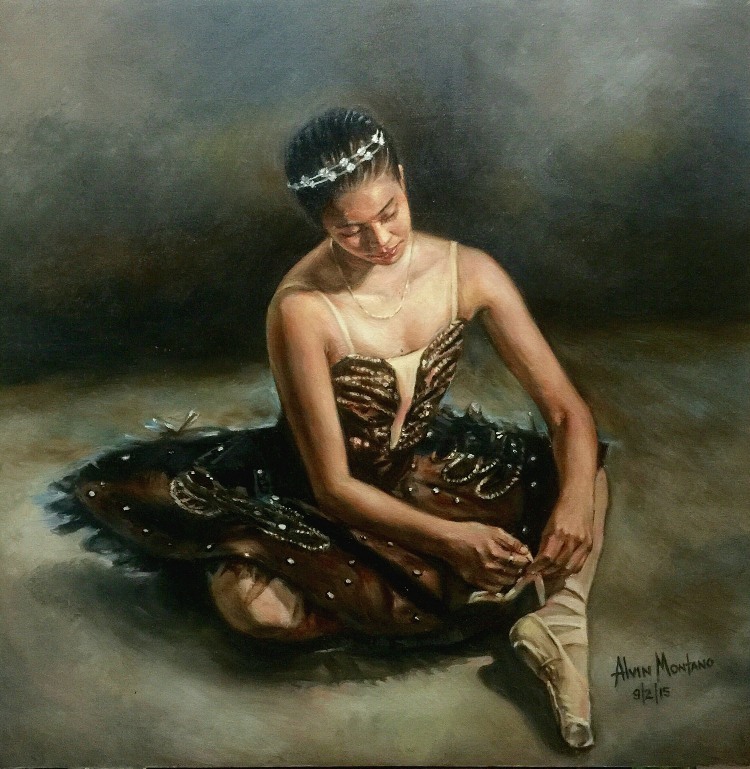 For inquiries on the exhibit, please contact 588-4000 local 8300 or email gatewaygallery@aranetagroup.com. Gateway Gallery is open daily from 10 a.m. to 7 p.m. It is run by the J. Amado Araneta Foundation, Inc. of the Araneta Group of Companies. The MICHELIN Pilot Sport Experience (MPSE) blazes its way back to the Sepang International F1 Circuit in Malaysia for the 12th consecutive year. For over 25 days in August and September, Michelin will treat more than 600 selected invitees from Asia, the Middle-East, Oceania and Europe to another round of excitement and sheer driving pleasure in the iconic Malaysian track. Dealers, brand stake-holders, influencers and media were invited to participate in the event together with twenty-five (25) lucky consumers from the Philippines, Vietnam, Malaysia, Singapore, Thailand, Indonesia, Australia, Japan and Korea. They won their MPSE trip by participating in Michelin Driving Passion, a social media campaign conducted recently that reached 70 million consumers in the region. Campaign participants were invited to describe and share the emotions they experience when they are behind the wheels. A shared passion for beautiful speed machines that will elicit unique emotions awaits everyone at the MPSE. Guided by an elite team of professional racing drivers and instructors, participants will drive premium racing vehicles such as the Citroen DS3 R1, the Formula 4 car, the Renault Clio IV, the Lamborghini 2014 GT3 and a Formula Le Mans 2-seater exclusively designed for this event. Meeting motorsports champions who embody the spirit of the race and getting to connect with them is part of what makes this year’s MPSE unique. Special VIP guests in 2016 include Earl Bamber, former MPSE instructor who raced his way to victory and became 2015 Le Mans champion, and Kris Meeke, winner of the 2016 WRC Rally Finland. At the MPSE, Michelin will launch its new MICHELIN Pilot Sport 4 tyre, the newest arrival in the MICHELIN Pilot Sport family. This tyre is specifically designed for premium sedans and sport cars whose owners desire enhanced driving pleasure through superior performance, a unique looks and safety. Participants will experience first-hand the tyre’s excellent steering control and high level of reactivity during a dedicated workshop. 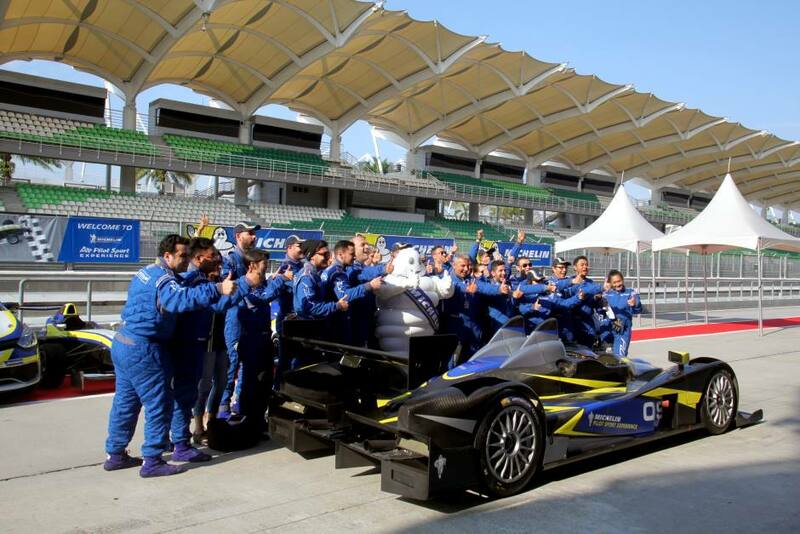 Why does Michelin continue to organize and enhance MICHELIN Pilot Sport Experience, year after year? “There is nothing that can better convey our passion for performance than sharing it with our key stake-holders right where it is most apparent; on fantastic cars, in an iconic setting, with real racers, where one can feel, touch and even smell the difference that MICHELIN tyres can make”. Michael Nunag, Chief Representative of Michelin Philippines, said. “The enthusiastic comments and the stronger engagement with the Michelin brand which we see in our invitees every year are a clear confirmation that MPSE is an extraordinarily effective platform to share our brand values and make a lasting impression”. The MICHELIN Pilot Sport Experience was first launched at the Sepang International Racing Circuit in 2006 and has grown today into a key Michelin annual event in the region. Taco Bell, the world’s leading taco food chain, invites you to #tastethehype as it innovates the classic taco with Chalupa Supreme. 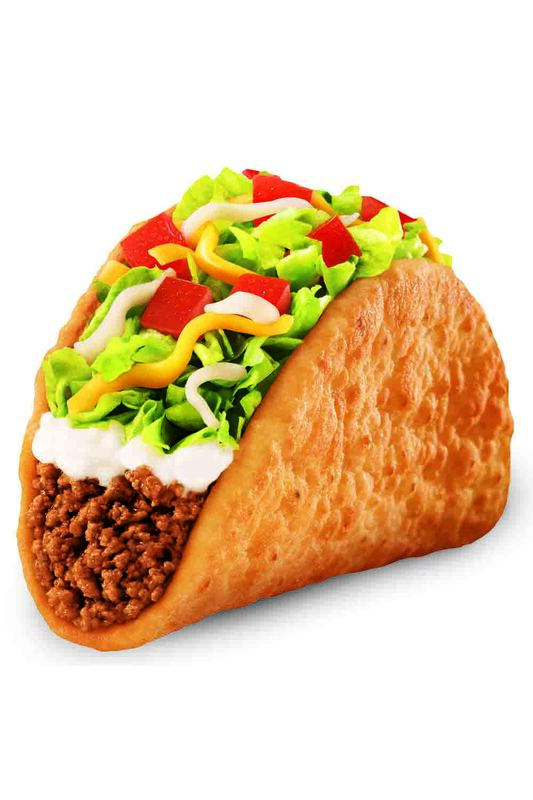 The Chalupa Supreme features a deep-fried crispy and chewy flatbread filled with seasoned beef, sour cream, shredded lettuce, diced tomatoes and a three-cheese blend. The result: a delightful mixture of textures and flavors that is distinctly Taco Bell. Transforming the everyday taco into an experience you won’t find anywhere else. Already satisfying on its own, the Chalupa Supreme is available for P99 when ordered a la carte. You may also pair it with nachos and your favorite soda for only P149. Go ahead and #tastethehype today as Taco Bell’s Chalupa Supreme is available for a limited time only. 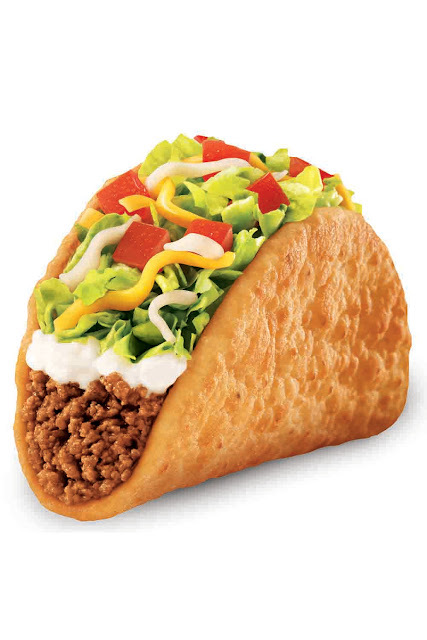 Learn more about Taco Bell’s latest offering, the Chalupa Supreme, and try other delectable treats that you’re sure to love only at Taco Bell. HashTag #TacoBellPHL across Facebook and Instagram. You might know someone who eats a lot and never exercises but doesn’t seem to have an ounce of fat on him. While you, on the other hand, exert a lot of effort at the gym every day, but can’t seem to lose weight. It may not be a problem of self-discipline, but rather, it may be due to imbalanced hormones that can affect your metabolism. According to Dr. Rami Cohen, an international specialist renowned for his study on the hormones involved in obesity and weight loss, obesity is a disease, a medical condition arising from hormonal imbalance. Human Growth Hormone (HGH). This hormone is responsible for stimulating growth, cell reproduction and the regeneration of cells in our body. It also burns fat by breaking it down rapidly and making it a source of energy. HGH peaks during the teenage years and slowly declines with age. However, there are ways to naturally increase HGH production. Avoiding processed food which are loaded with simple carbs and sugars and getting good quality sleep for 8 hours a day are some of the important factors in maintaining healthy production of Human Growth Hormone. Serotonin. Also known as the “feel good” or “happy hormone,” serotonin is released in the brain to tell the body when it is full or satisfied. It is nature’s own appetite suppressant. Successful weight loss depends on the power of serotonin to control food intake. You can balance the serotonin level in your body by eating low-fat or fat-free food and healthy amounts of protein and carbohydrates. 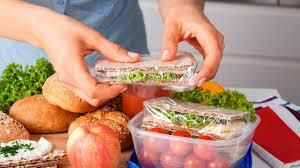 When serotonin’s ability to increase satiety is enhanced, you will eat less, feel more satisfied and lose weight. Insulin. This hormone regulates blood-glucose levels in our body and is responsible for moving sugar from the blood into the cells where it is used as energy. When you eat, your blood sugar increases. However, when your insulin level is normal – not too low or too high – it steadily distributes sugar to the different parts of your body equally. You can control the amount of insulin your body produces and how well your cells respond to it by cutting back on high-calorie food that can lead to spikes in blood sugar levels. Eating healthy is the best, most natural and safest way to balance these three hormones and maintain a healthy weight. There is no need to overexert yourself with extreme exercise or use unsafe pills or injections that may be unsafe or have side effects. Cohen’s Lifestyle Program, a rapid weight loss and wellness program through nutrition, provides personalized prescription of tested foods and their combination that allows the body to do what it is naturally designed to do, and that is to burn fat effectively. Armin Van Buuren is coming back for more! After the huge success of Armin Only Intense Manila, Armin is back in Armin Only Embrace! Armin Only Embrace is a 5-hour-long experience in which worlds are linked by live performances, dance acts, visuals, special effects and, above all, by the 5 times No.1 DJ in the world, Armin van Buuren. Together with his team, the DJ brings a next-level experience to the world, something that is completely new to the dance scene. He will end the night with a special vinyl hour. Armin Only Embrace is the biggest thing Armin has ever done. 'Armin Only Embrace' focuses on Armin’s sixth and most recent studio album 'Embrace'. The legendary DJ’s spectacular show is also special in that it features different music styles. Artists and bands including Kensington, Mr. Probz, Eric Vloeimans and Cimo Fränkel are part of the tour. Armin’s world tour had a sensational kick-off on 6 and 7 May 2016 in a sold-out Ziggo Dome in Amsterdam. ‘Armin Only Embrace’ happens on November 25, 2016, 8pm at the Mall Of Asia Arena. Presented by Heineken® and produced by MCA Music. A wild mix of non-human entities dominate the scene as AXN’s newest show BattleBots6x60’ feature robots fighting for glory. BattleBots show cases an action-packed tournament of machine versus machine inside the ring, each one meticulously designed and built by its creator. 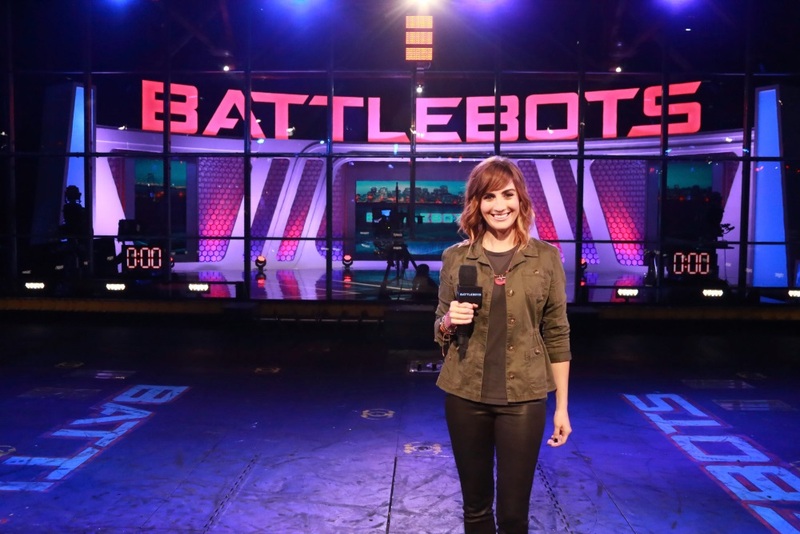 A decade after it was first aired, BattleBots is presented as a 6x60’ series with bigger and even better robots. Even the arena is a new and improved version of the original, allowing viewers to witness the action close up.As ten years has passed, viewers can expect to see more advanced creations and more even better opponent-crushing power. Each episode brings a real thrill and engages fans in the heat of the combat. Follow the series as new creators bring mecha-entities to life and fight for the coveted title. The show is hosted by Sam Ponder, Chris Rose, Kenny Florian, and Faruq Tauheed. The judges are Jessica Chobot, Fon Davis, and Leland Melvin. AXN is available on Cable Link Channel 38, Cignal Digital TV Channel 61, Global Destiny Cable Channel 61, Dream Channel 20, Gsat Channel 12, SKYCable Channel 49. This week in Wheels, join the audacious team of motoring journalists Matteo Guidicelli, Kap Maceda Aguila, Manny Delos Reyes, Ulysses Ang and Angel Rivero as they take some of the country’s ultimate expedition rides for a spin on the open road. 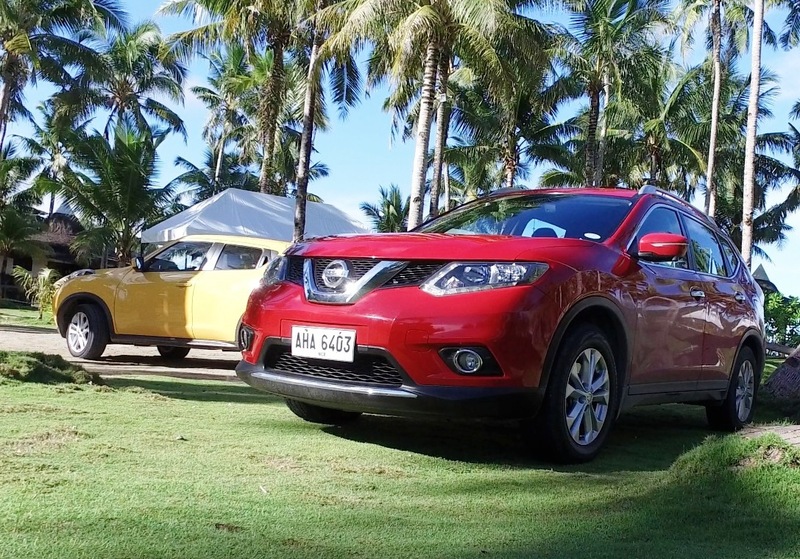 Uly takes in the beautiful sceneries of Samar aboard the robust Nissan X-Trail and Juke. Explore the automobiles’ superb features and discover why they’re the ideal vehicles for outdoor adventures. Matteo visits his adorable furry friends at the Philippine Animal Welfare Society (PAWS) and takes them on a ride with the Chevrolet Trax. As he test drives the Trax, witness the compact SUV’s swift performance and streetwise features and technologies. Meanwhile, Kap exposes some of the bad habits of Pinoy drivers that should be avoided to prevent road rage. He will also share the consequences of aggressive driving and tips on dealing with it. Get P50 OFF to your GrabCar ride this August!